It’s that time of year again. Where gardens are in full swing and this heat has them growing like crazy! I went out this morning and harvested my second batch of lettuce & my third batch of basil! Anyone who knows me well knows I LOVE Basil. There’s something about the smell and taste I can’t get enough of it. From using Mrs. Meyers Basil Dishwashing Soap to having Basil a scented Candles around the house I am always surrounded by the smell. When we moved to our home back in December, I told my husband that I would really like to have a vegetable garden this year. I have only ever had one once and that was when I was living home and it didn’t go so well due to poor soil we had purchased for the planter box my father made me. 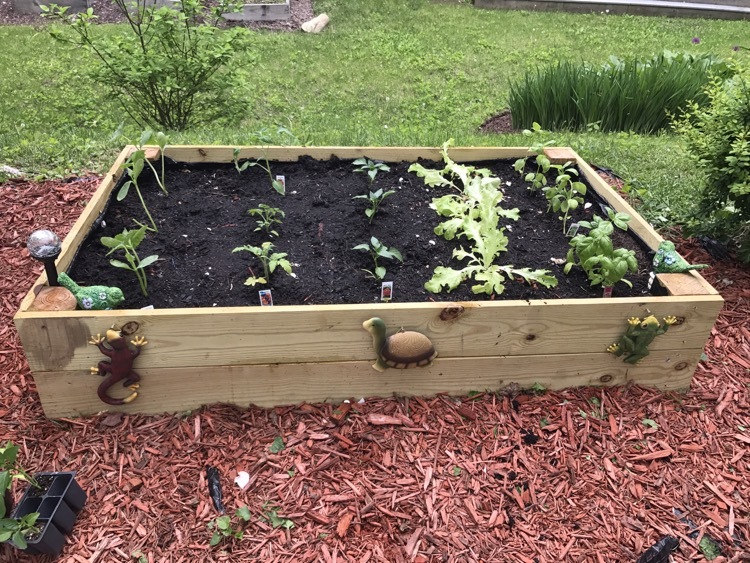 In the spring, my husband made me a beautiful planter box and we filled it with Natures Care organic specially mixed soil meant for raised garden beds. I was determined to have a good year! So far, we’ve had plenty of rain, a lot of hot sunny days, and the garden is thriving. I planted 5 Basil plants, 3 varieties of Tomatoes, 3 variety of peppers (some hot some sweet), green beans and cucumbers. The photo above was the first round. I relocated the lettuce to a big pot in the shade, and added a few more plants. 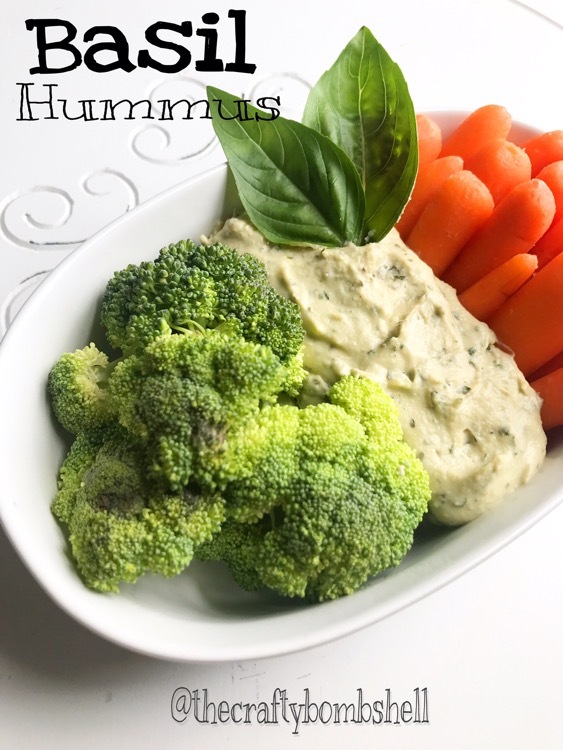 I have been trying eat more healthy, and I love hummus! My husband has made it for me a few times but after my harvest of Basil today I wanted to try my hand at it. The girls at work are going to love it and I can’t wait to share it with them! Blend until all ingredients are blended and mixed well. 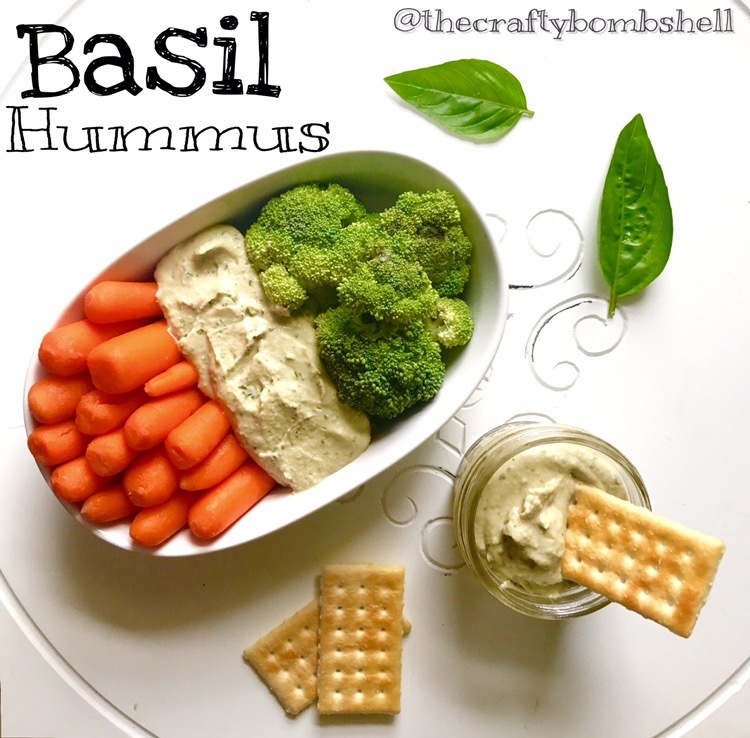 Store in mason jars or other small snack size containers.